Hot tubs are one of the greatest ways to feel relaxed. Soaking in a hot tub with a great book, a movie playing, with great company, or even solo and idle, could be a wonderful experience. It’s a great way to just enjoy your time, loosen up, and de-stress. Many people have extremely hectic work or family lives, so it’s essential to find a way to calm down and unwind from those restless days. A hot tub- especially a blow-up hot tub- can be a fantastic way to start. Below we’ve mentioned some facts and tips about inflatable hot tubs as well as the best places to put them. What Are Inflatable Hot Tubs? A hot tub is basically a large tub or vessel that contains a large amount of water for recreational or therapeutic purposes. Usually more than one person makes use of the hot tub with relaxation in mind. The hot water from the tub seeps into the pores of the skin and cleanses it. The hot water also helps with sore muscles as it increases the blood flow and encourages healing. Most hot tubs also have jets that release water pressure which works as a massaging element. Inflatable hot tubs, or blow up hot tubs, are in essence, the same. They are usually made with thick PVC material to keep the water from melting it down. Blow up hot tubs are inflated and deflated according to water pressure, the size of the hot tub itself, and the amounts of people that will be soaking in it. For example, more people means that the tub needs to be inflated to a certain limit so that the pressure does not increase. They can eventually be deflated and put away until needed again. However, it is not necessary for it to be deflated as the PVC it is made of is usually extremely strong and can withstand any temperature. Someone who is on the lookout for purchasing a hot tub may ask themselves why they should purchase an inflatable hot tub as opposed to a built-in one. There are, however, numerous benefits as to why they should. The first of which is maneuverability or mobility. The fact that it can be inflated and deflated and is not attached to anything, makes it extremely portable. Some types of blow up hot tubs can literally be rolled away, tucked in a bag and taken on a trip. When you get bored of them in a certain location you can easily move it to a different area without many people having to lug it around. The second perk is the PVC’s flexibility. Regular hot tubs are made up of vinyl or plastic, which does not really feel comfortable if they’re sat in for long periods of time. The flexibility of the inflatable hot tubs though helps it to shape according to someone’s back and height, so they don’t need to adjust and readjust their position in order to get comfortable. A third advantage is how inexpensive it can be. Building a hot tub can be extremely expensive, regardless of the material used. On the other hand, a portable hot tub is created with relatively thin material (compared to the built-in one) all around so it makes it less expensive than if it were built from cement. Also, because it is portable, it can be used more, so even if it costs more than the built one, because they can become on the expensive side, the cost per use is pretty cheap. A fourth advantage are the different sizes, shapes and colors that are available. Below there is a list of the different types of hot tubs, but overall even the color spectrum is extensive. Given that they are made of PVC it can become quite clear, if it comes with LED lights, then the color could be changed by the second. The fifth advantage is its uniqueness. If one were to throw a party for example, a hot tub could be the main focal point, and can be an interesting recreational tool that makes the party more alluring. The last, but not least point is the option of glamorizing the hot tub. Many hot tubs come with extra features that can be purchased if needed. For example, a hot tub could come with accessories that are super helpful. Some examples of those accessories include a step ladder, a cup holder, different styles of LED lights, a removable net to play sports like volleyball or water polo (this depends on the size of the hot tub). One of the most helpful accessories are mini attachable pools, where kids could enjoy the bubbles without straying too far. The hot water could be too extreme for children; therefore, the attachable pool can be a little easier on their skin. There are many types of hot tubs which range from different prices, sizes, and shapes. There are also types of hot tubs that depend on the usage itself. 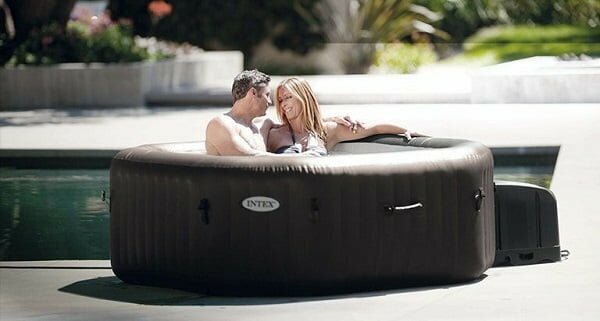 An inflatable hot tub center could tell you all about the tubs, their different types, and help you truly understand their uses. A guide will help you find your perfect hot tub with reviews that will help you in being truly satisfied with your purchase. Some hot tubs, such as the Intex PureSpa, specifically targets design, quality, and air jets, at a reasonable price. It could be hard to know what you want, but if you list out the list of needs from most important to least then finding the hot tub you need will be easier. If design is your top priority then looking at the pictures and what will grab your attention is essential. If your main concern is size (which is extremely important) then checking the measurements of the place you want to place it in is step number one. Step number two is making sure of the measurements of the tub itself so that it isn’t too big or too small. If it will be placed in a room, it must be proportional to the room so that it doesn’t take up the entire space. If it will be placed in a garden, then the measurements must be taken to be able to rationalize the size of the hot tub, but still being able to make use of the garden itself. Another aspect that is extremely essential is the price. If you’re looking for a spacious tub that is inexpensive, then design or niche features could be disregarded. When on a budget though it’s important to note why you’re purchasing this tub. If it’s for intimate use, for less than four people, then it does not have to be extremely big; vice versa if it’s for a party or a large number of people. Some of the mentioned features also have to be taken into consideration. With kids being involved, the pool accessory can be very handy, but it might have to decrease the hot tub budget itself. With larger budgets, creating several locations for the tub should be step number one, before purchasing the tub. Spring is a time where the weather can go to both extremes. It is a beautiful time of the year, where the trees are blooming and there is minimal wind. At night though it can get a little chilly. The hot tub in this case can literally be placed anywhere! Whether you have a garden or not, you can find a place where it will be perfect for it. Outdoors, it can be placed in a garden, in a patio, or in an empty shed. Indoors, it should be placed in an area that is properly ventilated because the heat of the hot tub could create an issue. A hot tub in the summer is helpful yet can be used less. Given summer’s extreme warm weather, the hot tub should either be placed indoors or under some sort of canopy. If the sun is shining directly, the heat of the hot tub with the heat of the sunlight, could cause a heat stroke or a thermic fever. Exposure to excessive heat is not healthy and placing the hot tub under direct sunlight can be extremely damaging. In this case though it can then be used at night when the sun doesn’t have extreme effects. With the warm weather, getting out of the hot tub will not be a complete shock on the body. Fall time is mesmerizing, with its near chilly weather and different colors of leaves. Sunlight in the fall is not extremely vigorous, so placing it outdoors could be optimum. If the hot tub will be placed in an area that is surrounded by many trees, it can either be placed indoors or on the roof. Hot tubs, or any enclosed water space requires maintenance and having leaves constantly falling within the hot tub could be a hassle. Depending on the size of the tub it can either be supported on the roof, or a large balcony. The view would be amazing, and it will be protected from leaves. In general, though, many hot tubs come with a cover, so when it is not in use it can be covered so that the water does not get contaminated. Winter may be one of the best times for a hot tub. The water that seeps within the skin can be perfect to get completely warm from the inside. Given that the sun is not strong at all in the winter, it could be utilized in any time of day. Keep in mind though, that if it is used at night, going out of the hot tub and into the house could increase the chances of catching a cold. In this case the proximity of the hot tub to the house itself is extremely important. Another way is by placing it in a shed that can withstand high temperatures, much like a sauna would look. That way you could get out of the hot tub, dry yourself, get dressed and walk outside to go to your home. If none of the above is applicable, then having a ventilated sauna room dedicated for the hot tub can be the way to go. It must be noted that if is placed outside, and in an extremely cold location, then it may not be good for the mechanical parts in the tub, like the pump, to be placed outside because the water could freeze before its heated. Convenience and proximity with regards to hot tubs focuses on some aspects. How will you remove the water, and where you’ll move it to? What purpose is it serving at the time of use? Is there a pad that protects the ground from the heat? If placed in a room, is there proper ventilation? The first question could be one of the most important questions to answer before you purchase a hot tub. Where will it be placed so that it would be convenient and easy to disperse the water? Many people who have pools, recycle water with a water recycling system that really saves time and money. Although the system itself could come at a hefty price, like solar panels, the cost per use, or even comparing it to the alternative choice, the price eventually evens out. Another option, which will work for those who have a garden is to disperse the water in several days, in the garden itself. To do that though, if there was chlorine placed in the tub before, take several days to make sure that the chlorine is fully gone. The second question depends on the specific use. As mentioned before, hot tubs could be a unique party feature. So, it should be placed in the center of the location so people can get in and out of it easily. On the other hand, some people may want to put it in a location that is more sheltered so that neighbors would not see anything. One element that is of extreme importance is the placing of the hot tub. Given the extreme heat of a hot tub, a pad may have to be placed to not destroy the ground on which it is placed on. Some tubs don’t need a pad, they are thick from the bottom and are protected, those however will be very large and much harder to pack. Ventilation is key, so it could be more convenient to place it in a location that is already ventilated, or to be placed outside so that it doesn’t become extremely expensive to ventilate the place. There are several aspects and questions to consider before purchasing a hot tub. Fully committing to purchasing an inflatable hot tub may take several steps and techniques as to not ruin the experience. The place it will be put in is both easy and hard. It is easy given that the tub is portable, but weather, size/capacity, platforms, and all the aforementioned really changes where it can or can not be placed. Once you’ve passed those steps, then the first and foremost action you should take, is fill up the tub, and unwind.